Positioned on the busy route between Broadway market and Columbia road this ci ty farm has become a popular pit stop for weekend market goers. An amazing Italian café Frizzante is nestled into the heart of the farm, serving hungry passers fresh seasonal Mediterranean cooking and beautiful farm breakfasts. Apart from the draw of the café the city also has a pottery studio, garden and of course happy farm animals. This farm has become a vital part of the community offering a vegetable box scheme for locals and courses on environmental living. They even have a bike repair service to help cut down on the emissions within the capital, and more importantly helping you get your veg home! This farm has worked hard over the last 20 years to build the farm from a derelict lorry park to the place that it is today, in the future they wish to keep the farm going looking at how the farm can grow in an ever changing London. 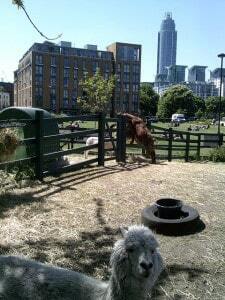 Just off the busy main Vauxhall Junction you may be surprised to find this small but perfectly formed city farm. They have managed to fit in a range of different animals from horses to fancy ra ts, to an ecology garden complete with a stag beetle nursery and community allotment (which grows plants that are used as dyes for the spinning classes that can be taken at the farm). Across the road there is also a riding school with a paddock! The farms excellence was rewarded with a prize for ‘Commitment to the Community’ and was the winner of ‘Business of the Year’. 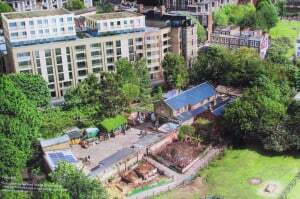 The City Farm was created in the space of a large scale demolition of buildings that was taking place between 1972-1976. The local residents protested by setting up the North Lambeth Neighbourhood Council, and encouraged people to take responsibility for their community. Youth projects began popping up on unused land in and around Vauxhall. By 1976 a group of architects were squatting on a small empty plot of land and began working there. The farm started out as Jubilee City Farm, it was a collaborative project that was used to grow vegetables, and care for livestock. Since this the farm has grown but still thrives on the dedication of volunteers. Tucked around the railway – if you have ever been on the Overground near the far m you will have noticed horses, and possibly you will have had a sneak peek at the city farm. Here you will find a wonderful collection of wildlife that unfolds as you explore this little piece of paradise, from the frogs that reside in the lively pond to the goats that frolic under the brick arches. All members of the public are welcome to go and explore with over 50 animals (including goats, sheep, horses, ducks, chickens, pigs and cows), community gardens and wildlife ponds. This City farm is nestled on a former railway goods deport. It all started in 1978 as a response to the local community’s wishes to co nvert wasteland into allotments after losing their land to developers. The East End has a long tradition of backyard farming so it wasn’t long before rabbits, chickens and geese appeared at the allotments. 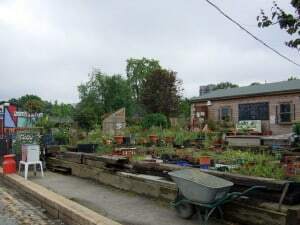 As the allotments grew in status it attracted local funding, meaning they were able to employ staff and develop links with the wider community. The farm has faced many threats over the years, and in 1987 there was a lack of funding that almost caused the farm to close. The farm has regularly been under threat from developers, and it is only from the help of charities, companies and public funding, as well as strong local support, that has enabled the farm to grow and stay open. Spitalfields City Farm gets over 18,000 visitors a year and covers 1.3 acres, within this space they keep a selection of farm animals and grows in every available space. Muchute is one of London’s biggest farms. 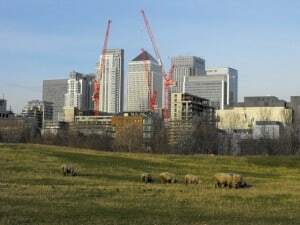 The park and farm cover 32 acres in the Isle of Dogs. The area was originally a piece of derelict land that was created from the spoil of Millwall Dock. For ages it was left alone to become a natural wilderness and remained untouched, however, in 1974 the site was set aside by London Council for the construction of a high rise estate. This turn in events resulted in a public campaign against these plans, the local people that live on the island and the people that work in Muschute joined together, showing the loyalty and affection of these people. The park is known as the “People’s Park” for the area. and the farm itself is fairly compact, however it is full of animals out in the fields, a petting zoo and a duck pond. The main focus of this area is the Equestrian Centre, which is a riding school that caters for all ages with an all-weather floodlit school, show jumps and cross country fences that cover the many acres. So no matter how late you finish work, or whatever the weather is doing, you can always have a ride! Although if this sounds a bit too adventurous you can just bring a picnic and pretend you are in the countryside. These are just a few of the city’s farms, why not take a different day trip just to have an outdoor adventure!